← Day 120 – Shasta go home! Today we put California behind us. 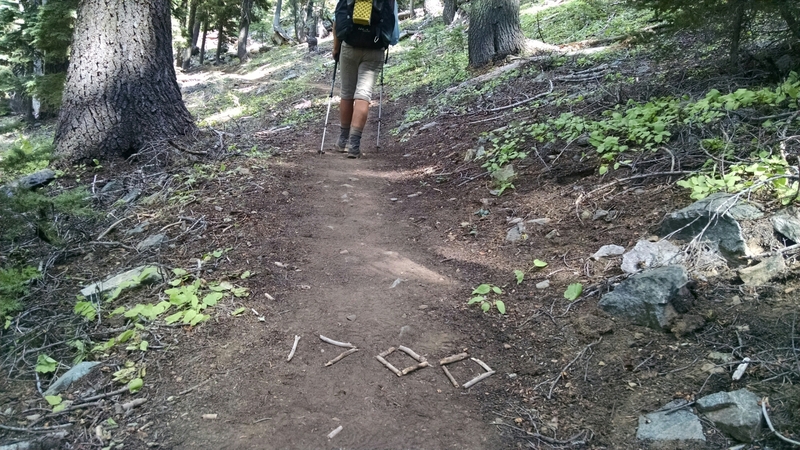 We hit our four month anniversary of being on the trail and have walked over 1700 miles to boot. Last night was probably was the best night’s sleep we’ve had on the trail. We are fully invigorated. Even my pack rash does not hurt that bad. The salt from my excessive sweat from the wonderful heat wave we’re having has turned my shirt into a grater of sorts against my skin as my pack shifts against it with each stride rubbing salt into the wounds on either side of my lower back. It feels like I am wearing burlap. When my shirt finally dries it’s as stiff as a mainsail, and could probably be used as one in a pinch. 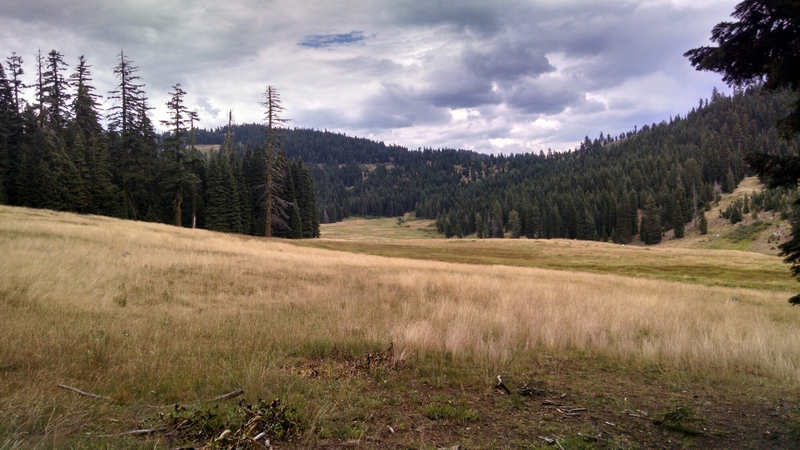 The tread is easy on our feet, but California has one final FU in store before we exit…down deep into a meadow so we can go uphill to the border, and a view of the distant peak that is Mt. Shasta. We have had a peek and full view (all sides), back to a peek of Mt. Shasta for several hundred miles now. At first it was exciting, but now it’s just plain annoying. As we dip into the meadow, the skies begin to darken and the air rumbles with anticipation of rain. It appears that Oregon may require that we clean up a bit before we enter. We reach the border and find Frank there as well. He celebrates briefly with us and takes our picture. How fitting to be exactly 4 months on the trail and now out of California. We are fairly overwhelmed by the magnitude of what we have accomplished thus far, and are emboldened even more to continue to Canada. The last 300 miles seemed to drag on, and became a mental game of sorts. Many hikers have talked about the Nor Cal blues. How their motivation has wained and their joy and wonderment for the trail has soured some. So many have fallen ill. And the heat has been nearly unbearable. Many say they’re done once they hit Ashland. California is “enough” they say. We however are nowhere near done! We have not walked this far, and gone through this much effort, injury and illness to stop now. We march on past the border, we discuss buying a lottery ticket, seeing we are now out-of-staters, which should better our odds of winning…in theory. We remark and ponder how an arbitrary sign and/or invisible line only recognizable on a map has the power to delineate how and where people live, what laws they live under, the taxes they pay, and/or the language they speak. We walk until we reach the 1700 mile mark…another milestone. We decide we will try and make it to 1707, so we are better set up for getting to Callahan’s for the bottomless bowl of spaghetti. Plan set. We water up at spring that flows from a crack in the hillside. The skies rumble overhead, and dark clouds begin to move it. We welcome a thundershower, and decide if it rains hard enough we will strip down and get out a bar of soap. As we reach the top of an exposed mountain top it begins to sprinkle lightly, and then the thunder becomes more ominous. Luckily the trail ducks back into a dense grove of trees as it begins to rain softly. We decide to put on our pack covers before exiting the protection of the tree line. Just before we don our covered packs, it begins to pour. To avoid getting cold, and wet (we were fine with getting wet) we dig out our rain jackets. Thunder bellows and echoes all around us like the beating of big bass drums at the symphony. We wonder if it’s accompanied by lightning. We get our answer all too soon. 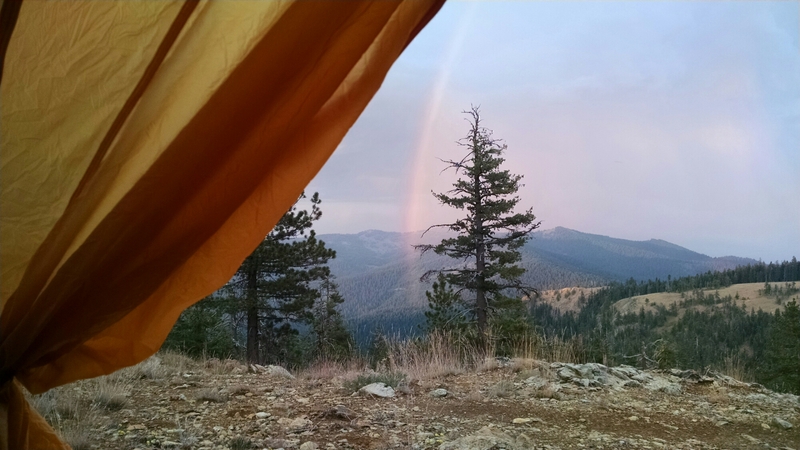 Just as we cinch down our packs and pick up our aluminum trekking poles, the sky above us lights up brilliantly like a new sun, a thick column of white light shoots over our heads and behind us, then BOOM! We drop our poles and hit the deck. So much for walking in the rain. Off go the packs and down the hilltop we bound to lower elevation and hopefully the safety of a low clump of trees. Thunder, rain and lighting rage all around us. We hope the other hikers we have been leapfrogging with all week are safe. Nothing to do now but wait it out. 20 minutes later we crawl out of our hovel and begin to hike again. The air is fresh and the trail is washed anew, as if no one but us has stepped foot on it. We can see fresh smoke billowing from over a hill ahead of us and even thicker smoke over the hill behind us, from where we had been an hour ago. This is our first experience with forest fires caused by lightning (in SoCal most if not all our fires are started arsonist when the Santa Ana winds blow). 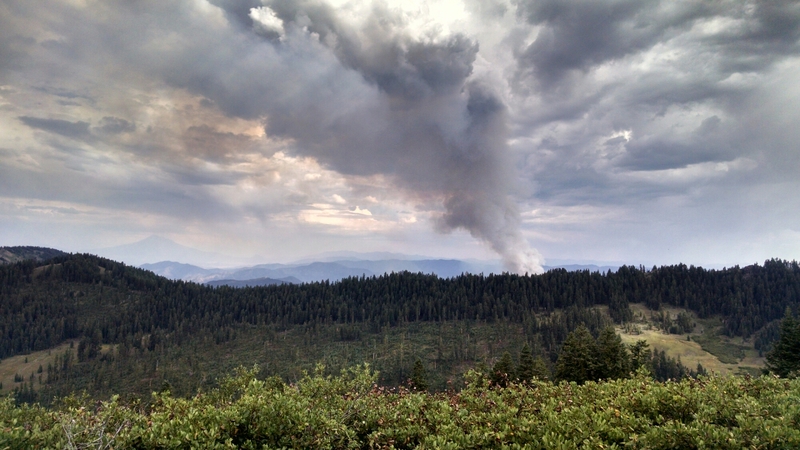 Now we understand why the fire crews stage in the mountains during predicted thunderstorms, and what they mean when they say its “fire season”. We hike on to our intended stopping point. The air is rich and electric. Forest service planes and helicopters buzz overhead. More thunderclouds form on the horizon. With 2 miles to go the sky behind us begins to darken, it will be miracle if we are able to make our destination and set up camp before it begins to pour. In actuality we have no choice really, but to keep on, as there is no place to pitch camp and we are on top of a ridge line and often the tallest things there. Just as we reach our camp spot it begins to drizzle. We set up quickly and take refuge in the vestibule of our tent. As quickly as it started, the rain stops and we are treated to a full and brilliant rainbow, a double one as well. We can see a fire burning on a hillside across from our location. Over that same way, the sky lights up like a laser light show, with a thunderous sound track. We ooh and aah, and hope that it does not come our way. As the day settles into night, the show continues and becomes even more fantastic. It reminds me of the first movie I ever saw as a kid in the theater, on the big Century 21 movie screen, Fantasia. I am on the edge of my seat fully enthralled with all five senses actively engaged. Bliss. Sleep comes fitfully though, as flashes of light and echoes of thunder continue throughout the night. 12 Responses to Day 121- OREGON!!! Wow, what an amazing day you had! And great photos — Thanks for sharing!! 962 miles to Canada…seems so close!! Piece of cake!! Congrats, Team M!! What an incredible accomplishment to date. Continued success!!! 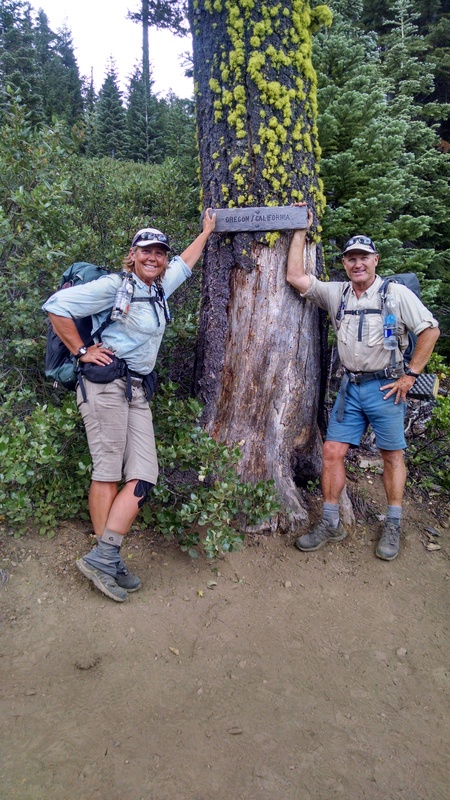 Just a quick hi from Dennis and Linda Phelan – the couple you hiked into Crater Lake with and sat with at lunch. Sure hope your hike is going well. We were able to spot 15 gal of water at hwy 138; hope you were able to enjoy some of it. We stayed at Diamond Lake Lodge; what a great place to relax. We got home and am now enjoying being done with Oregon and planning what is next. Again, it was nice meeting both of you and good luck on the balance of your hike. 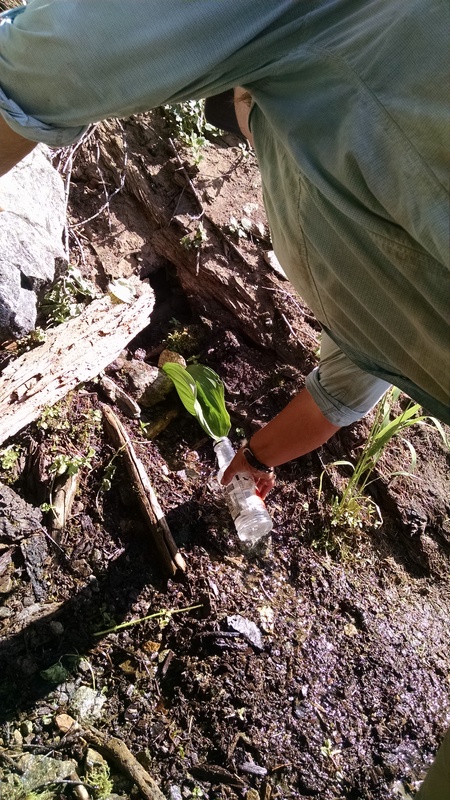 The cache was perfect and much appreciated by not only us but other thru-hikers. 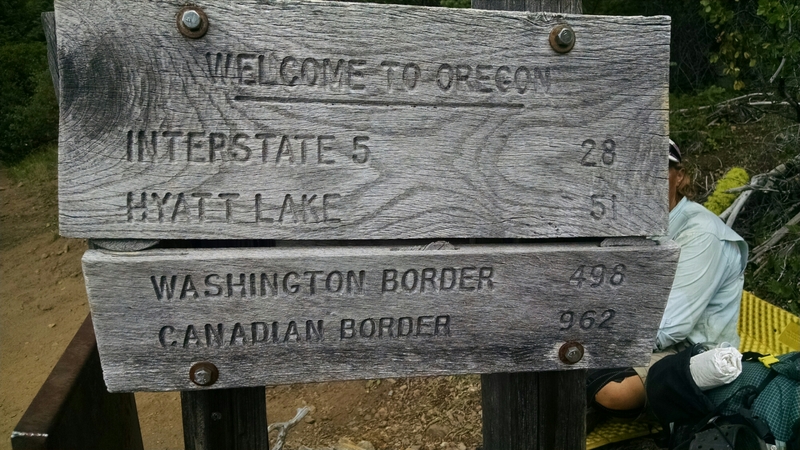 We have made it just past the highest elevation point on the trail between Oregon and Washington. If you plan to do any portion of California, let us know and we’ll do our best to be of any help we can. We hope to be sharing adventures like you two for many more years as well. That’s Oregon for ya! Welcome!